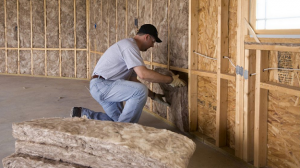 Summary: Lower your energy bills with proper home insulation. There are several popular materials in use, including Fiberglass, rigid foam, and spray foam. When anyone thinks of insulation, there is a good chance that what they will picture is the “pink” Fiberglass insulation. The R-values range from 3 to 3.7 per inch. There are two types, Fibreglass that comes in batts and loose fill. Loose-fill should only be installed by a professional as it requires that it is blown into the space. Rigid foam is often in the shell of the home. There are two types: expanded polystyrene and extruded polystyrene. Foam is also found in the side walls of the basement. Rigid foam tends to have an R-value of around 4.5 to 5 per inch. Proper installation requires that both types are covered and sealed due to the chemicals used during production. Like the above two materials, spray foam comes in two forms: low-density open-cell polyurethane and a high density closed cell polyurethane. Spray foam is popular now thanks to celebrity home improvement stars highlighting its uses. Closed cell spray foam is good for attics and exterior walls and should be applied by a professional. Closed cell spray foam also has the highest R-value of these materials at 5.5 to 6 per inch. Written by the Foam Factory, Inc. If you are in the market for polystyrene insulation, visit them and place your order online. « Why you should screen potential Renters?